Do you like frozen desserts? I sure do. Frozen Fruit, Ice Cream, Yogurt – just put it on a stick and I’m good to go for convenient, tasty snacking! While attending the Health & Nutrition Editor Showcase event in February, I was introduced to a healthy snack called frozen Kefir from the Lifeway family of products. 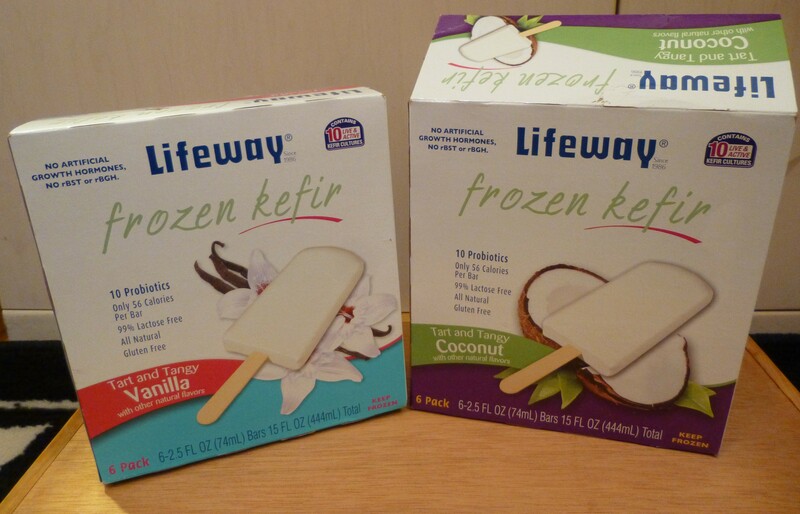 The folks at Lifeway were happy to send over a couple of boxes of their Frozen Kefir Bars in two delicious flavors and I have been enjoying them this past week as a light and low calorie snack while TV-watching! For those who need a little back-story, Kefir is a cultured milk product that is similar to yogurt in that it contains probiotics – healthy bacteria that aid in digestion – as well as having other healthy benefits. I actually did a little research on the differences between Yogurt and Kefir, and you can check that out for yourself at This Link and learn about Lifeway Kefir’s various benefits by clicking Here. The most distinctive flavor profile aspect of frozen Kefir is its tart sourness, which keeps the bar from tasting overly sweet. The Coconut Frozen Kefir Bar tastes exactly like Coconut as soon as it hits your tongue, but it is a light sweetness that contrasts well with Kefir’s natural tanginess. The Vanilla flavor also optimizes the natural tanginess to create a taste similar to delicious, rich Vanilla cheesecake — and who doesn’t love that? Kefir’s texture is creamy and there are only 56 calories per bar – which makes it an ideal dessert choice for anyone watching their weight. These all-natural bars are gluten free and 99% lactose free as well. Lifeway Frozen Kefir Bars come in four flavors, including the very tasty Coconut and Vanilla mentioned in this review as well as Green Tea Raspberry and Peach, which sound delicious! Sign up to receive free discount coupons on Lifeway Products and find stores near you that sell Lifeway Frozen Kefir Bars at This Link!